The West Eagle Meadows Trailhead is one of the 'late season' trailheads to open in the early Summer due to the area's heavy snow accumulation and high elevation. 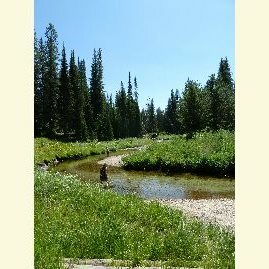 Located near West Eagle Creek and meadow, this site is frequented by hikers and equestrians alike who want to enjoy a day or extended trip into the Eagle Cap Wilderness area. The combination trailhead and equestrian camp offers parking facilities for both stock and non-stock users, and has hitching rails, a loading ramp and fee bunks.